Smartek ST-10 Review: The Smartek ST-10 Travel Steam Iron is a steam iron you can easily bring along on road trips, vacations to avoid wearing clothes that have become rumpled in your suitcases. This compact steam iron is easy-to use and easy-to-store. No longer do you have to look rumpled in your souvenir pictures, for with the Smartek ST-10, your clothes will look pressed and neat no matter where you are. Steam function could be better. If you are looking for a handy iron to bring along on all kinds of trips, then the Smartek ST-10 Travel Steam Iron might be just what you are looking for. This small steam iron straightens out all your clothes easily, getting rid of the wrinkles that your clothes might have gotten from being tossed around in your suitcases and backpacks. The device can be used for steam or dry ironing. The Smartek ST-10 Travel Steam Iron, weighing 3.6 pounds, comes with a fold-able handle so you can store it away in any traveling bag with ease. No matter where you go, you can bring and use this little steam iron thanks to its dual voltage switch (120-600 watts/220-800 watts). Most of the people who have used the Smartek ST-10 Travel Steam Iron are happy with the quality of the results they have gotten. The iron works well, and takes out all the wrinkles and creases it needs to. The device heats up quickly, which is important in case of last minute wardrobe malfunctions and other quick fix-ups. Many people are happy with the way the Smartek ST-10 Travel Steam Iron works. The compact size and design of the small steam iron has been commended. Customers also like how the iron heats up fast, for quick fix-ups. While trying out the device, some people have had problems with folding down the handle, saying it was too hard to push down. 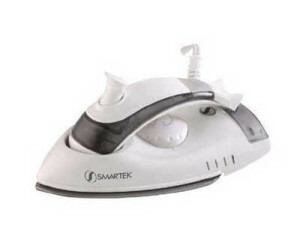 The Smartek ST-10 can be recommended to anyone looking for a simple iron to bring along on any trip or vacation, without the added cost of special features, although the iron has not received glowing user ratings. If you enjoyed reading this review then read an in depth review on Travel Smart Travel Iron.